113 Commonwealth is located on the north side of Commonwealth, between Clarendon and Dartmouth, with 109-111 Commonwealth to the east and 115 Commonwealth to the west. 113 Commonwealth was designed by Cummings and Sears, architects, and built in 1876-1877 by Weston & Shepard, builders, for dry goods merchant Walter Hastings, Jr., one of a symmetrical pair of houses (113-115 Commonwealth). Walter Hastings is shown as the owner of 113 Commonwealth on the original building permit application, dated October 3, 1876 (the permit application for 115 Commonwealth is not included in the Building Department’s files). 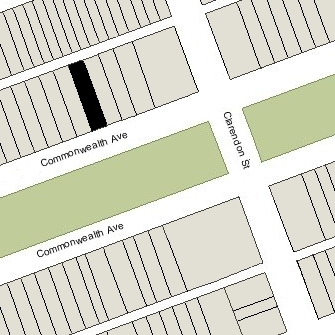 Walter Hastings purchased the land for 113 Commonwealth on September 25, 1876, from real estate dealer Henry Whitwell, who lived next door at 111 Commonwealth. He had purchased the land from the Commonwealth of Massachusetts on March 28, 1871. Click here for an index to the deeds for 113 Commonwealth. Walter Hastings and his wife, Elizabeth (Glidden) Hastings, lived at 117 Commonwealth. After 113 and 115 Commonwealth were completed, they moved to 115 Commonwealth and on December 31, 1877, they sold 113 Commonwealth to Jacob H. Hecht. Jacob Hecht and his wife, Carolina (Lina) (Frank) Hecht, made 113 Commonwealth their home. They previously had lived at the Hotel Vendôme. Jacob Hecht was a boot and shoe dealer, and later a wool merchant and banker. He was a leader of the Temple Ohabei Shalom congregation and of the Elysium Club, a social and business club formed by the Temple. In 1890, the Hechts founded the Hecht Neighborhood House to help Russian Jews acclimate to their new life and to prepare for work in America. First located in the North End, Hecht House moved to the West End in 1920 and to Dorchester in 1936. The Hechts were friends of future Justice Louis Brandeis, whom they assisted both financially and socially while he was in law school and during his early years of practice as an attorney. Jacob Hecht’s younger brother and business partner, Louis Hecht, Jr., and his wife, Rosa (Frank) Hecht (sister of Jacob Hecht’s wife), lived with them at 113 Commonwealth. They previously had lived at 18 Claremont Park. 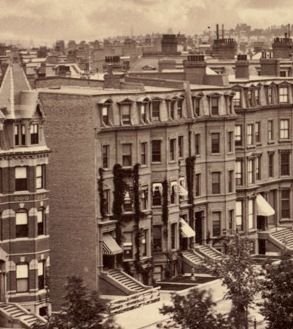 By the 1879-1880 winter season, Lina and Rosa Hecht’s brothers, boot and shoe dealers Abraham Frank and Daniel Frank, were also living at 113 Commonwealth. By June of 1880, at the time of the 1880 US Census, they also had been joined by Jacob and Louis Hecht’s nieces, Rosa Liebman and Sophia Liebman, the daughters of Gustav Liebman and Fanny (Hecht) Liebman of Baltimore. Rosa Hecht died in July of 1881. Louis Hecht and their three young children – Harriet (Hattie) Lena Hecht, Simon Elias Hecht, and Sarah (Sally) Hecht – continued to live at 113 Commonwealth with Jacob and Caroline Hecht, who had no children. Daniel Frank married in October of 1881 to Rosa Liebman and they moved to 546 Columbus. Abraham Frank continued to live with the Hechts during the 1883-1884 winter season, but moved thereafter to the Parker House hotel. Sophia Liebman probably continued to live with the Hechts, where she was married in November of 1886 to retail clothier Louis Strauss; after their marriage, they lived at the Hotel Victoria at 273 Dartmouth. On February 8, 1889, Jacob Hecht transferred 111 Commonwealth into Lina Hecht’s name. Jacob and Caroline Hecht, and Louis Hecht and his children, continued to live at 113 Commonwealth. Hattie Hecht married in June of 1899 to Marcus Cauffman Sloss, a lawyer in San Francisco, and Sally Hecht married in May of 1901 to Dr. Henry Ehrlich, a physician. After their marriage, they lived at 172 Commonwealth. By the 1901-1902 winter season, Jacob and Lina Hecht had moved to the Hotel Victoria at 273 Dartmouth (where he died in February of 1903), and Louis Hecht and his son, Simon, had moved to The Westminster (southeast corner of St. James and Trinity Place). On July 1, 1901, 113 Commonwealth was purchased from Lina Hecht by Harriet Pierce (Weeks) Anthony, the wife of banker Silas Reed Anthony. They previously had lived at 465 Beacon. Their three children — Andrew Weeks Anthony, Ruth Anthony, and Reed Pierce Anthony — lived with them. Andrew Anthony married in January of 1912 to Elizabeth Linda Colt. After their marriage, they lived at 39 Bellevue and then moved to Bristol, Rhode Island. S. Reed Anthony died in March of 1914. 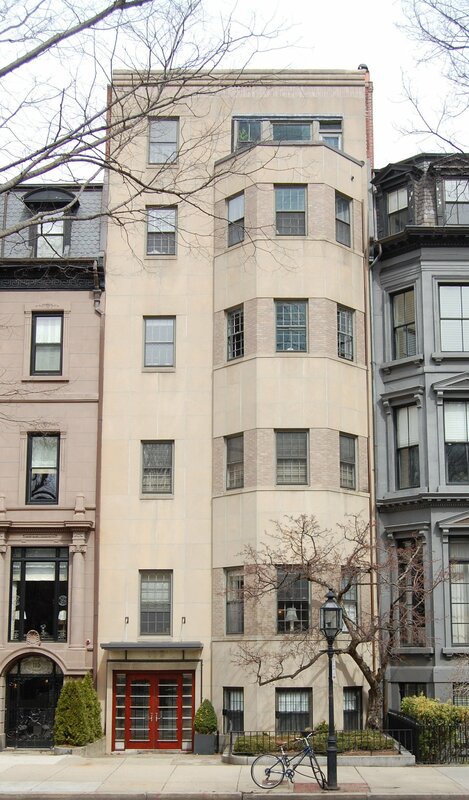 Harriet Anthony and their unmarried children, Ruth and Reed Anthony, moved temporarily to 125 Beacon and then to 175 Beacon. During the 1914-1915 winter season, 113 Commonwealth was the home Charles Elliott Perkins, Jr., and his wife, Leita Montgomery (Amory) Perkins. He was a real estate and mining investor in Burlington, Iowa, where they made their home. His mother, Edith (Forbes) Perkins, lived at 223 Commonwealth. She was the widow of Charles Elliott Perkins, who had been president of the Chicago, Burlington, and Quincy Railroad. Charles and Leita Perkins returned to Burlington after the 1914-1915 season. During the 1915-1916 winter season, 113 Commonwealth was the home of Susan Goodman (Clark) Stellwag, the widow of merchant Gustav Stellwag. Her usual residence was in Paris, but (according to an August 22, 1915, “Table Gossip” entry in the Boston Globe) she “was staying in Boston on account of the war.” By the 1916-1917 season, she had moved to 247 Berkeley. Ruth Anthony married in February of 1916 to attorney Lyon Weyburn, and Harriet (Weeks) Anthony remarried in June of 1916 to attorney Randolph Frothingham. Both couples had lived at 175 Beacon after their marriages and moved to 113 Commonwealth by the 1916-1917 winter season. Reed Anthony, Harriet Frothingham’s son by her first marriage, lived with them. Lyon and Ruth Weyburn continued to live at 113 Commonwealth during the 1917-1918 winter season, but moved soon thereafter to 285 Marlborough. Reed Anthony, a banker in the firm founded by his father, married in November of 1921 to Mary Abbe Hartwell. After their marriage, they lived at 113 Commonwealth during the 1921-1922 winter season, but moved soon thereafter to Brookline. Randolph and Harriet (Weeks) Frothingham continued to live at 113 Commonwealth until 1929. They also maintained a home at Beverly Farms. On February 2, 1929, the house was damaged by a fire which started in the basement, from an overheated furnace. The housekeeper, Mrs. Sophie Smith, was rescued from a coping outside a third floor room. The Frothinghams moved soon thereafter to Brookline. On May 8, 1929, 113 Commonwealth was acquired from Harriet Frothingham by attorney and real estate dealer Walter Howard Gleason, and on June 22, 1929, it was acquired from him by Charles Edward Sampson, a wholesale dry goods merchant. He was unmarried and lived with his sister, Gertrude Sampson, at 111 Commonwealth. 113 Commonwealth was not listed in the 1930-1937 Blue Books and was shown as vacant in the 1930-1937 City Directories. The same month, Maurice Goldberg had filed a permit to convert the house into a seven family “tenement,” including modernizing the façade and adding a new story to make it a five story building. The permit was denied by the Building Department, but approved by the Board of Appeal on December 29, 1936, which found “the structure has outlived its usefulness as a single-family house.” Construction took place in 1937 and was designed by architect Herman L. Feer. 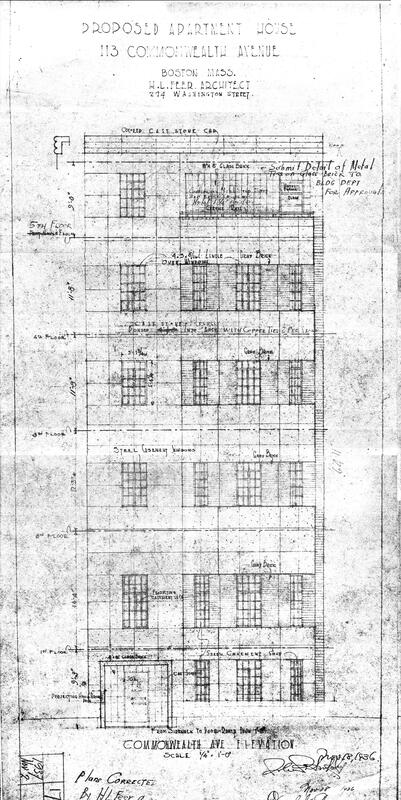 Architectural plans of the remodeling — including elevations and floor plans — are included in the City of Boston Blueprints Collection in the Boston Public Library’s Arts Department (reference BIN P-143). On June 20, 1937, the Boston Globe reported that 113 Commonwealth was among the buildings exemplifying the “new home trend of electrification” with the installation of electrical appliances in the new apartments. On August 21, 1939, Maurice Goldberg transferred 113 Commonwealth to James F. O’Brien, Jr.; on October 19, 1939, James O’Brien, Jr., transferred it to James Henry Fuller; on February 19, 1940, James Fuller transferred it to William A. Sargent; and on March 12, 1948, William Sargent transferred it to Walter S. Gainey. The property was held by each of these owners on behalf of the Goldberg family, and on March 9, 1959, Walter Gainey transferred 113 Commonwealth to Maurice Goldberg as trustee of the Maurice E. Goldberg Charitable and Educational Trust. 113 Commonwealth remained the property of Maurice Goldberg — one of a number of holdings of the Maurice E. Goldberg Charitable and Educational Trust — until his death in July of 1972. On July 22, 1976. the trust sold 113 Commonwealth to his son, Richard H. Goldberg (a resident of Tuckahoe, New York). At the same time, it also sold him 207 Commonwealth and 246 Commonwealth, and sold his sister, Barbara (Goldberg) Weingarden (a resident of St. Louis, Minnesota), 234 Beacon and 29 Fairfield. On August 31, 1979, 113 Commonwealth was purchased from Richard Goldberg by Washington Financial Services, Inc. (John F. Tosi, president and treasurer). At the same time, it also purchased 207 Commonwealth and 246 Commonwealth. On January 30, 1981, Washington Financial Services converted 113 Commonwealth into seven condominium units, the 113 Commonwealth Avenue Condominium.